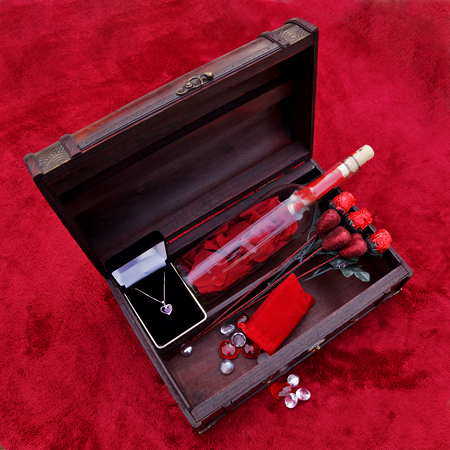 One of our most popular Valentine's Day gift items, the Antony and Cleopatra Lovers Chest comes filled with beautiful red, vanilla-scented rose petals. These fragrant rose petals are made to last forever and will serve as a constant reminder of your love year round. Antony's overpowering love for Cleopatra forces him to follow her and command of his actions. This unique gift comes complete with a famous poem written by William Shakespeare printed on our fine parchment paper, a bag of Valentine gems, and three Madeline milk chocolate sweetheart roses. A beautiful, sweet necklace and a great addition to any female's wardrobe or jewelry collection is this heart shaped amethyst and sterling silver, delicate necklace. With two outer heart-shaped rings encircling the three pronged setting of the amethyst, the stone shines bright as a ruby. Sterling silver necklace measures 16 inches long. Give the gift of love this Valentine�s Day with something she'll treasure for years to come. The treasure chest is made from wood and has an embossed overlay with a latch hook swivel closure. Treasure Chest dimensions are 14.5" - Height is 4.5" - Width is 6".